These scholarships are prestigious. If you are planning on studying abroad for your master’s degree, you should be processing your application for these scholarships right now. If you haven’t started, start ASAP. You don’t want to miss out on the opportunities. If you know anyone who wants to study for masters degree, do them a favor. Tell them about this. SHARE to your contacts. Get Email Notifications on New Funding Opportunities! Click here to Subscribe! The Chevening Secretariat is accepting applications for Chevening Scholarships from August until 6th November 2018 for graduates from developing countries. Australia Awards Scholarships, a cornerstone of the Australian Government’s development assistance program for Africa, provide access to postgraduate education, training and professional development opportunities for suitably qualified Africans from eligible countries. Gates Cambridge Trust offers full fee postgraduate (Masters and PhD) Gates Cambridge Scholarships for outstanding International students to study any course at the University of Cambridge, UK. This scholarship program will provide holistic support – financial, academic, social, and career counselling – to Masters students from Sub-Saharan Africa from 2012 to 2020. The German Academic Exchange Service (DAAD) is offering the MSc programme Tropical and International Forestry scholarship at the University of Göttingen to students from developing countries. The University of Cambridge has opened application window for all scholarships that require you to apply to the University via the normal online application form, and most scholarships that require you to apply by the relevant deadline. This year, the Swiss Government Excellence Scholarship is offering Masters scholarships to Art students (Artists). New information as More countries have been included. Search for your country. Ten awards of 100% tuition fee scholarships are available for students from the developing and third world countries registering for taught Masters programmes at Malaysia Campus. With a $350 million endowment, the students selected to become Schwarzman Scholars will live in Beijing for a year of study and cultural immersion, attending lectures, traveling, and developing a better understanding of China. Rotary Clubs in Japan through the Rotary Yoneyama Memorial Foundation is offering scholarships for overseas students to undertake undergraduate, masters and doctoral studies at Japanese university or graduate school. The Elisabeth & Amelie Fund by the King Baudouin Foundation aims to instigate a new form of support for sustainable water management in developing countries by financing on-the-spot internships for students from developing countries who are studying in Belgum. TU Delft | Global Initiative offers four Sub-Saharan Africa Excellence Scholarships every year. The aim is to stimulate excellent students from Sub-Saharan countries and strengthen our relationship with the countries they come from. The University of Oxford in collaboration with Pershing Square Foundation is offering international scholarships to support outstanding students on the 1+1 MBA, covering both the Master’s degree and the MBA year. If you’re an international student from an African nation and are self-funding your postgraduate studies, you could be eligible for a scholarship of £4,000, paid as a discount on your tuition fee. The purpose of the scholarship is to encourage and support international students from low to middle income countries with demonstrated frontline experience of working on development projects. Notre Dame Master of Global Affairs is a 2-year degree combining strong academics, skills training & field experiences around the world. All qualified students eligible for tuition scholarship and stipend. Subscribe to receive latest funding opportunities and competitions. © 2019 - After School Africa. All Rights Reserved. In 7 days, learn what past funding-winners know that most people don’t. You could get a Free Hard Copy of The Scholarship Digest. Your email will NEVER be used for any other purpose. In 7 days, learn what people who have won these funding opportunities know that most people don’t. Email video lessons. Be one of the lucky people to get a Free Hard Copy of The Scholarship Digest every month. More than 1,400 carefully selected opportunities for Africans. 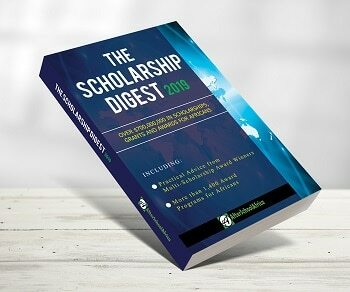 Download Chapter One of The Scholarship Digest 2019! We interviewed Multi-Scholarship Award winners and put everything we learned into this book.